Crocodile leather wallets have a universal appeal, which makes them the perfect gift for anyone. Suited to all personalities and styles, this croc wallet is a deep tobacco brown with a contrasting ostrich leather interior. This twist on the classic croc wallet stands out from the rest. If you’ve never owned a crocodile wallet before, now is the time to upgrade your look with this exotic wallet. 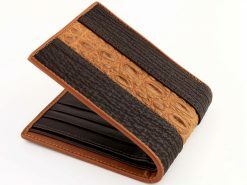 Suitable for any occasion and wardrobe, showing off one of these crocodile leather wallets is sure to attract attention. This wallet is very different from others on this site. The materials are alot more flexible than shark or stingray and because of this the wallet has a very thin profile because of it. I love the ostrich quill interior, it’s very supple and the crocodile has a very interesting texture.